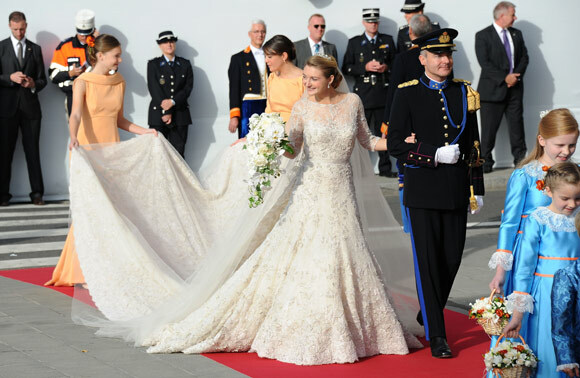 Yesterday was the Wedding of Prince Guillaume of Luxembourg to Belgium-born Countess Stephanie de Lannoy. In my last post, I covered the night-before Gala Dinner so now, it's the WEDDING! 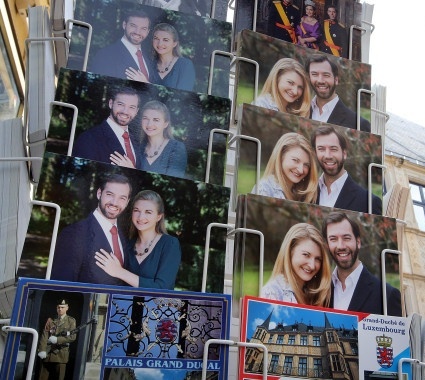 The tiny Grand Duchy of Luxembourg was all-abuzz with Royal Wedding Fever over these last few days--if not weeks. The boyishly handsome and bearded Guillaume is the last remaining heir-to-the-throne to get married, amongst Euro Royals. The royals of Europe are that continent's "Hollywood Stars". They really don't "rule" a nation per se, but are mainly there for the PR and to bring Tourism to their respective countries. And yes, they make lots of money for all the Euro tabloids. Le Gown: Princess Stephanie's gown was designed by Lebanese fashion designer Elie Saab. During the previous night's Pre-Wedding Gala Dinner, LOTS of the royals (including the bride and the groom's Grand Duchess Mother) wore Elie Saab Couture. So, it was not a surprise when yesterday for her MOST IMPORTANT DAY, she wore Elie Saab. Count Jehan de Lannoy, her brother, accompanied her to the altar. Princess Perfect: Stephanie in her Elie Saab Haute Couture Custom Wedding Gown--It took 3,200 hours for embroidery from a team of 15 people and 700 hours from a team of 10 seamstresses. The dress featured three-quarter sleeves, a bateau/boatneck neckline in the front and dipped in the back, and a belted waist above a full skirt and 13 foot train. The Gown DISH: Masses of fabric went into this creation: 76 yards of silk crepe and tulle for the lining, plus another 33 yards of satin organza, 55 yards of Chantilly lace, and 44 yards of Calais lace. More silk tulle was used for the veil. The leafy pattern embellished all over the ensemble included 50,000 pearls, 80,000 crystals, and almost 11,000 yards of silver embroidery thread. 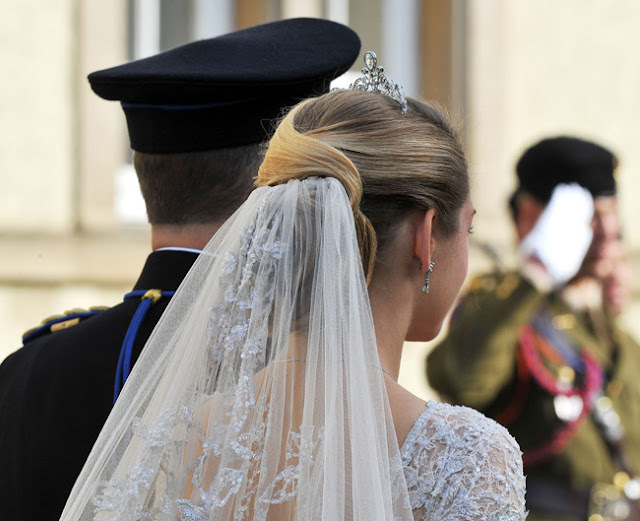 This is why custom wedding gowns--for royals--can cost as much as a small house in LA! And you can guarantee this one above did. 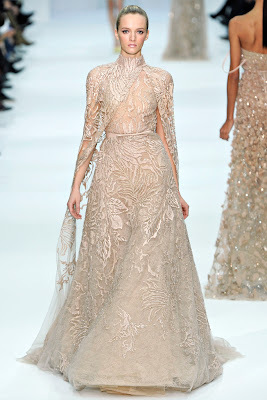 The Gown was inspired by these Elie Saab Hate Couture Gowns above--using similar sequin embroidery, full a-line shaped sweeping skirt silhouette and high neck fronts. Gorgeous train, superb silhouette, out of control beading and handwork...Wedding Gown perfection. 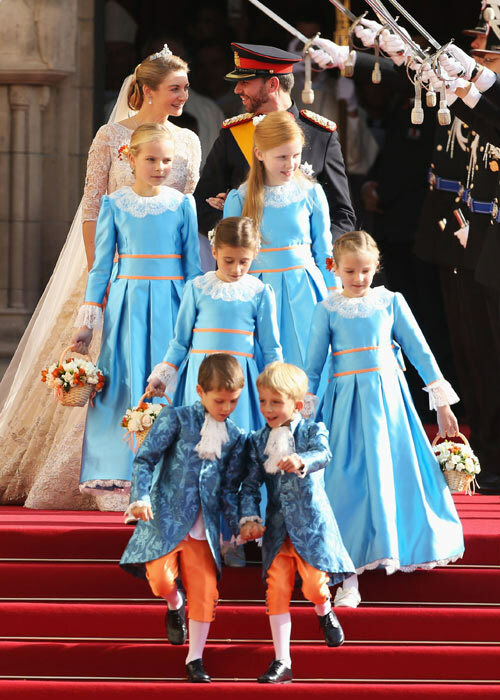 One the BEST Royal--if not just regular wedding gowns I've seen in recent history! I give her a 10 out of 10 as my Fashion Score. 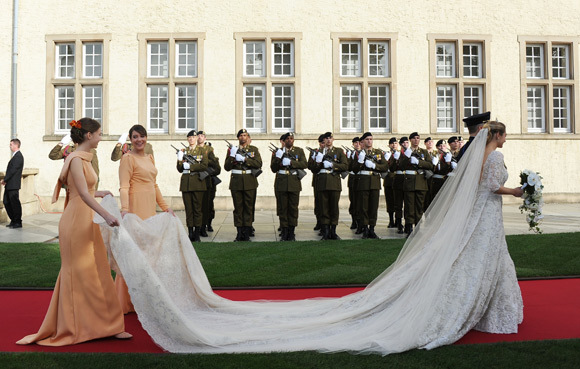 Peach Chic: Stéphanie was attended by two older bridesmaids, her new sister-in-law Princess Alexandra and her niece Antonia Hamilton. Both were dressed in peach/orange dresses from Edouard Vermeulen of Natan. 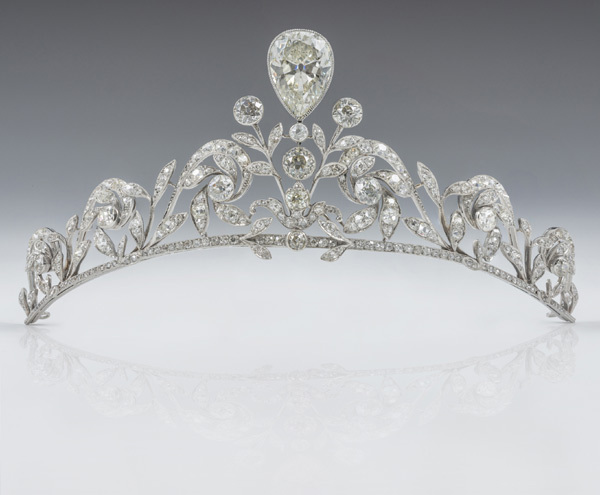 She wore a Lannoy family tiara, made of platinum and diamonds with a large inverted pear shape diamond in the high center. 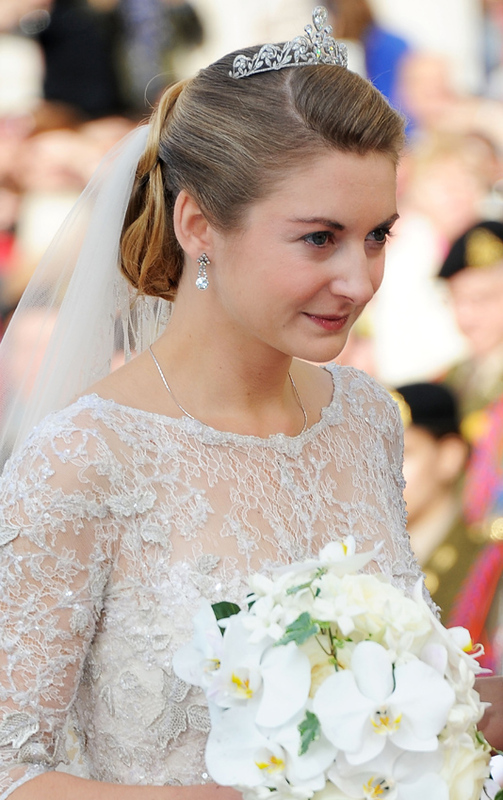 It was made by Althenloh of Brussels and was worn by Stéphanie’s sisters and sisters-in-law at their weddings. So, it is a family wedding tradition. 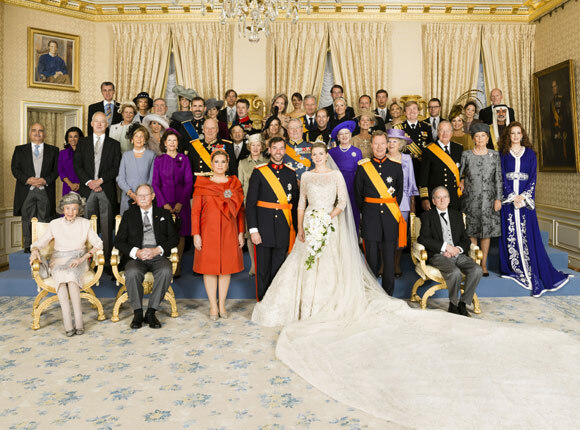 Grand Duchess Maria Teresa of Luxembourg and Prince Guillaume--Maria Teresa wore a coral colored coat and dress with a dramatic draped shoulder "shawl" held with a HUGE diamond brooch. Love her pillbox hat. Everything matched...except the shoes. Do you guys think she should have just gone "full-throttle" and worn matching coral-colored pumps? Or did we like these? 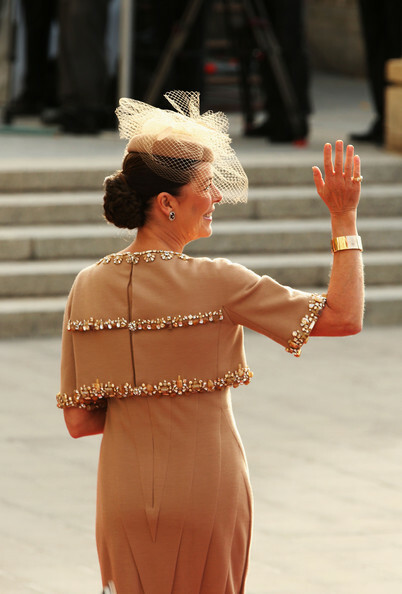 Princess Caroline of Hanover and Hereditary Princess of Monaco: The always-chic Caroline wore Chanel Haute Couture (naturally!). Her bolero and sheath dress was Chanel Haute Couture Fall/Winter 2010. It was camel colored wool crepe with hand-sewn sequins and beading with pleating detail. Just so you know kids, a Chanel Haute Couture dress/suit ensemble like this can put you back about $30,000-$40,000, especially anything with sequins and hand-sewn oversized jewels. Sophie, Countess of Wessex and Prince Edward--The Countess looked quite fab in this printed square-neck dress. The sleek hat with pheasant feathers is from Jane Taylor. The dress hits all the right points: three-quarter sleeves, right-at-knee length, a fitted drop-waist shape highlighted with a solid belt. Prince Felipe and Princess Letizia of Spain--Letizia wore a light lilac-colored applique coat, solid dress underneath and a wide brim hat, everything matching--color-wise. It was a bit of a Yawn for me. She loves all that applique embroidery, but sometimes--if not done delicately (like the Bride's Wedding Gown), it can come off as dowdy, heavy and dated. Prince Emanuele Filiberto and Princess Clotilde of Venice and Piedmont--French Actress Clotilde Courau looks chic in her Elie Saab Ready-to-Wear Fall 2012 Collection suit with 3/4 sleeves, side peplums and attached pencil skirt. This look is perfect for that fashionista girl attending a fab wedding. Crown Princess Victoria of Sweden, Duchess of Västergötland and her husband, Daniel Duke of Västergötland and her very handsome brother (the "Brad Pitt of Euro Royals") Prince Carl Philip of Sweden--I liked Crown Princess Victoria's unusual chappeau, but I though the rest of her look (coat with dress) was rather dowdy and unexciting. It made her look 15 years older than she really is. I think MY MOM has coat just like that. 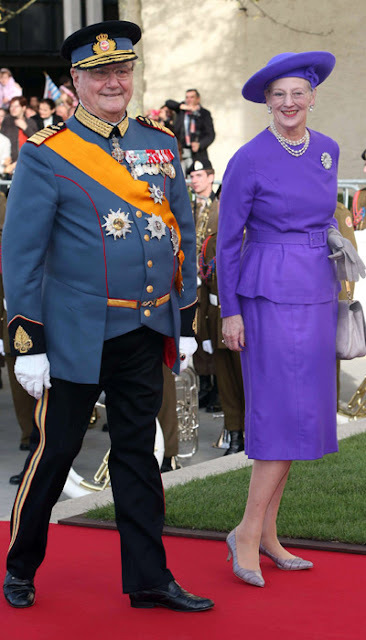 Queen Margrethe II of Denmark and Prince Consort Henrik--Queen Margrethe wore a purple long-sleeve suit featuring a very on-trend peplum, below-the-knee skirt, matching belt and matching hat. The pearls, diamond brooch, gray gloves and purse finish the look. She's ultra conservative and appropriate for a Queen, but the peplum tells me there's still a little "Fashion" in her still. But there's something about the whole outfit that looks a bit as if she had gone to a vintage store and found it. 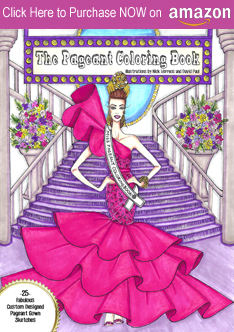 The princess seams on her upper torso are so Pattern Book 101. Now, Henrik, God bless him--first, look at his pooch. I love that his jacket fits him perfectly and obviously had to be custom made to fit his not-so-symmetrical body frame. Denmark 2.0-- Here are the "New/Young Blood" of Danish Royalty--Frederik, Crown Prince of Denmark (Margrethe's heir) and his wife, Australia-born Princess Mary--she chose a maroon dress/suit--again with the on-trend peplum detail, long sleeves, v-neck, at-the-knee pencil skirt--and that great hat. Not sure about this look for her however (minus the hat). The color is too dark and macabre and she looks as if she took no time in really trying to find anything semi-interesting to wear. He looks better--and definitely far more interesting- than she does. 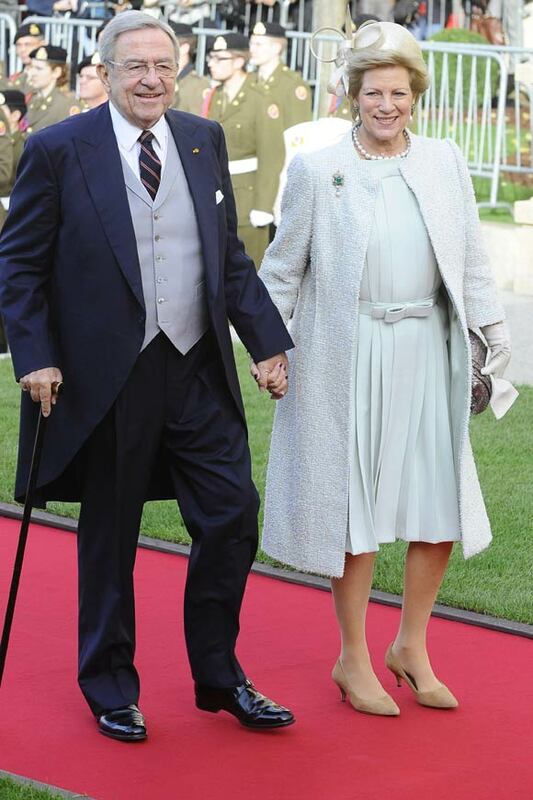 King Constantine II of Greece and Queen Anne-Marie of Greece--Both are always the definition of Style; they could give a lesson in it. Anne-Marie of Denmark wore a lovely boucle coat and matching-color pleated silk dress, belted with a bow-waist tie. She also gets sartorial "Nick Points" for her pill box hat as well. King Harald V and Queen Sonja of Norway--The Queen wore a silvery/lilac suit. Nothing wrong with this ensemble. It's respectable, conservative and non-fashion threatening. It's a nice suit one could find in the "Mother-of-the-Bride" section a very upscale department store. Queen Beatrix of the Netherlands: Three words: You Go Girl. One of the wealthiest monarchs in the World (before Bernie Madoff took a lot of it away! ), Queen Beatrix never dissapoints when it comes to her "red carpet" moments. She loves BIG hats, prints, ruffled sleeves...and color. 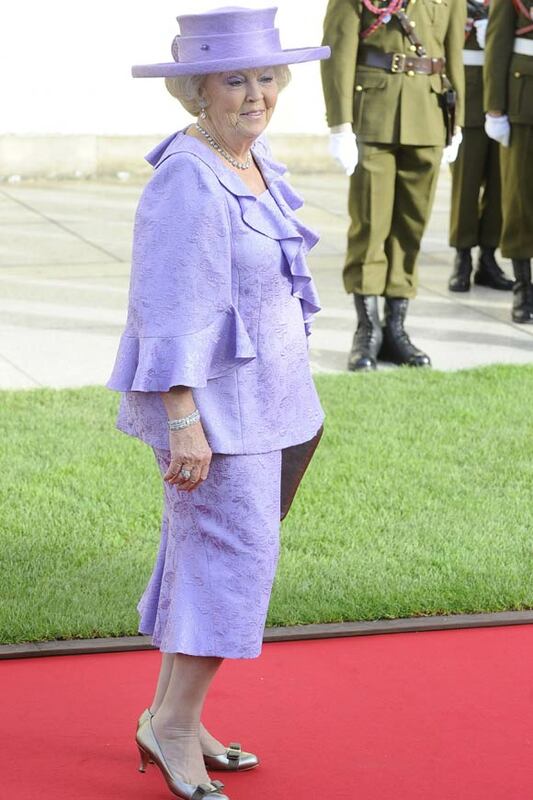 For yesterday's Luxembourg Royal Wedding, she wore a lilac colored jacquard ensemble with a cascade neckline, oversized ruffled-hem sleeves and yes, a BIG OL' Hat. She looks like the fun Grandma who will join you at the bar for some extra whiskey...without even battling an eyelash. PS: loving her gold-toned Ferragamo shoes. Fashion Diva Award Goes To: Princess Maxima of the Netherlands, here with her husband, Willem-Alexander, Prince of Orange and Heir to the Dutch throne. Argentina-born Maxima has taken a lesson from her Mother-in-Law Queen Beatrix and has become a Fashion Plate in her own--sometimes outshining the Queen with some of her over-the-top getup's. For the wedding, she certainly wanted to make a statement. It's all very High-Fashion; the UBER tight high-waisted pencil skirt (above the knee--Mon Dieu! ); the bell sleeves, the hat with oversized pheasant feathers; the stacked platform pumps. Princess Lalla Salma of Morocco, Princess Consort to the King of Morocco wore a traditional Moroccan caftan or takchita, in a bright royal blue color with white embroidery. I think she looked great and I especially love that she's representing her country as a "Style Ambassador" wearing something native to her country. 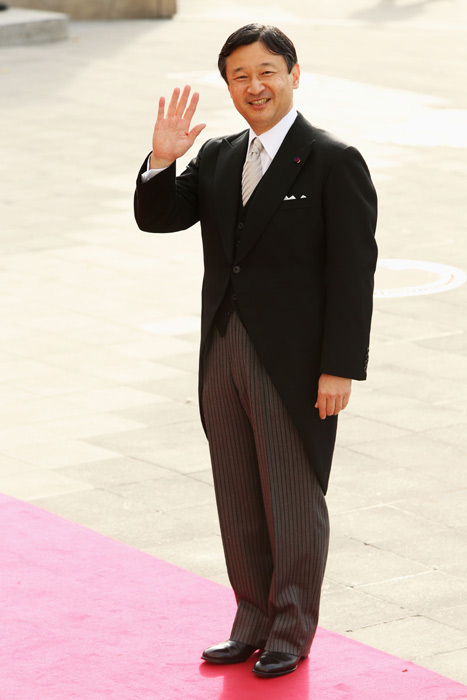 Crown Prince Nahurito of Japan: Nahurito wore a traditional tuxedo with tails--or "Morning Dress" suit. Well done. 4 Responses to "ROYAL COUTURE.....Wedding of Prince Guillaume of Luxembourg"
fyi it's not prince guillaume and princess stephanie. they are Hereditary Grand Duke and Duchess. Nick, what a fun post!! FYI, the official Luxembourg site refers to him as S.A.R. 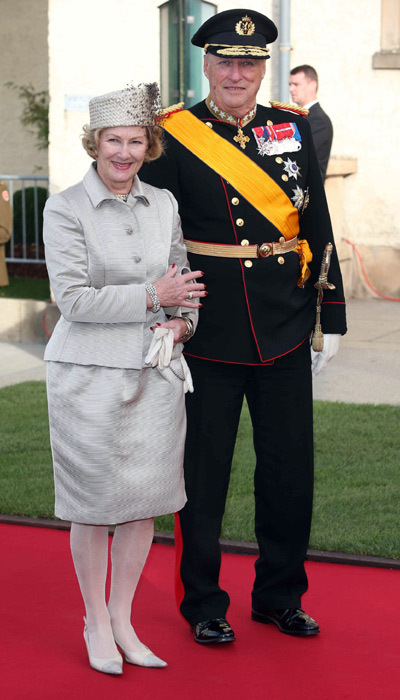 le Prince Guillaume, Grand-Duc Héritier de Luxembourg. 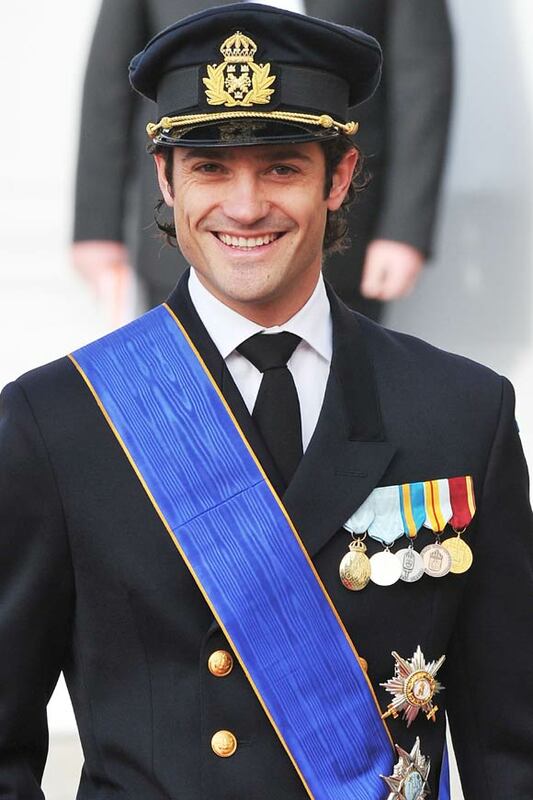 "Prince Guillaume" is perfectly acceptable. Maria Theresa's shoes were perfect. They matched the huge brooch and added more glitter. Coral shoes would have been too much. 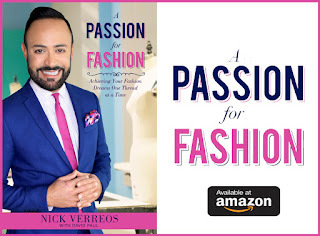 I otherise agree with Nick on nearly everything except the bride's score. I'd give her gown a 9.9. I thought the edges of the sleeves appeared stretched and could have been finished off in some way. Stephanie has come close to beating out Grace Kelly for the #1 position of Most Beautiful Royal Bride....she was straight out of fantasy. That train stretched out in full effect seen from above inside Notre Dame Cathedral is heart stopping. 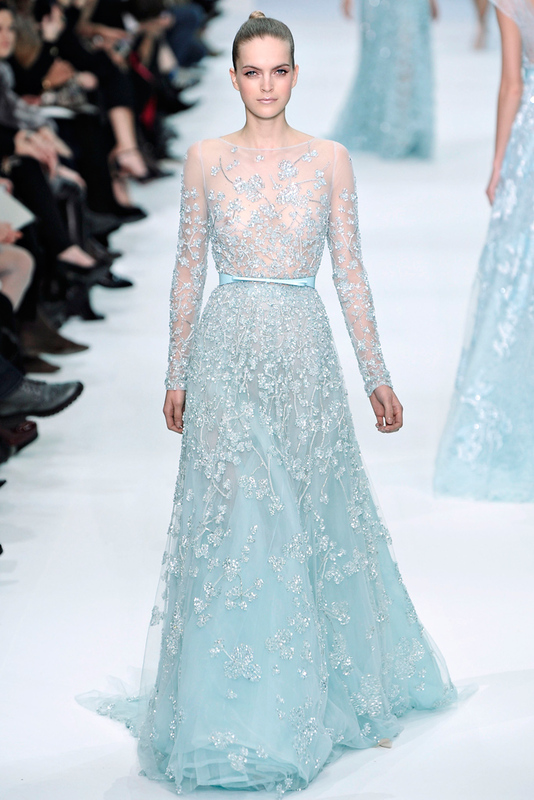 BRAVA PRINCESS...GREAT WORK ELIE SAAB!